The mid-1990s were perhaps the most monumental time period for Hip Hop. The east coast renaissance was in full swing, led by Notorious B.I.G., Nas and Wu-Tang Clan. The energy had partially been snatched back from the west coast, which had produced a number of timeless records that dominated the early 1990s. More innovative sampling, made possible by better technology, was dominating the soundscape of all influential east coast records at the time, and lyrically, some of the best verses in Hip Hop’s storied history were being laid to wax. Twenty-plus years later, it is easy for many to forget that other than Biggie, Nas and Wu-Tang, there was another New York act that was making major noise in Hip Hop in 1995. It was a duo that specialized in gritty yet stunning beats, and some of the best street-level tales that were being told not on an album named Illmatic or Ready to Die. Queens’ Mobb Deep had dropped their debut album in 1993, Juvenile Hell, to modest buzz but disappointing sales. The duo was back for more in 1995, with what is today an album that is painstakingly overlooked as one of the best Hip Hop albums of all-time. 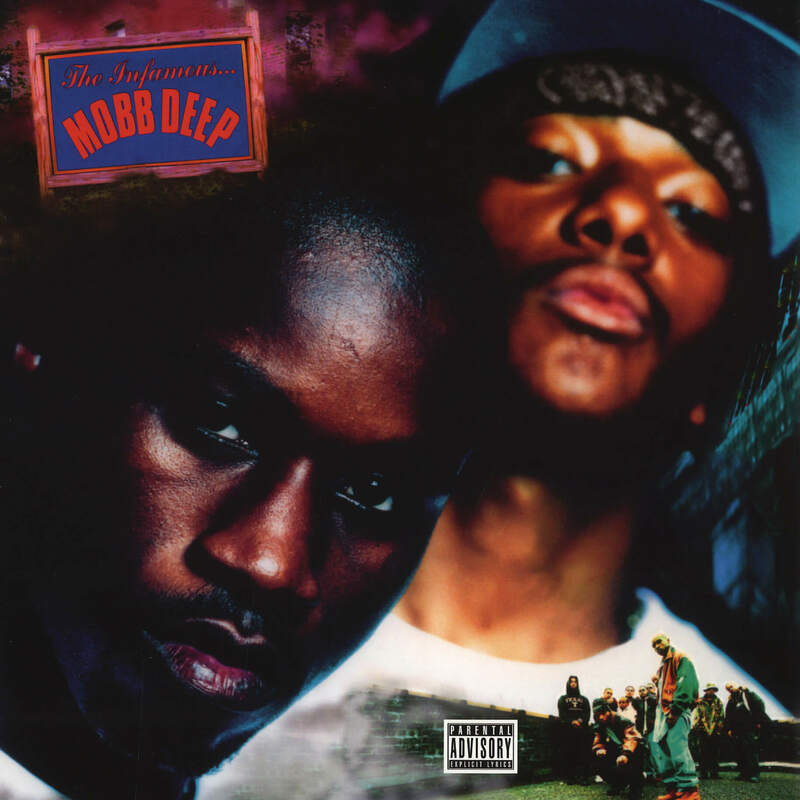 Perhaps feeding a bit off of success of a relatively gritty record like Illmatic, fellow Queensbridge artists Mobb Deep reinvented their sound from their debut and dropped their magnum opus, The Infamous, in April 1995. The album showcased a strong lyrical theme in street life and crime, and is criminally underrated. The production, handled by Havoc and Q-Tip, is nothing short of revolutionary. And though The Infamous is considered a classic in many circles, and achieved platinum sales in the United States, it is often overlooked in favor of some of the other influential Hip Hop classics that were released in the mid-1990s. The Infamous is a special album for many reasons. The album is driven by two incredibly influential singles, “Survival of the Fittest” and “Shook Ones, Pt. II”, both of which are among the most celebrated street anthems of all-time. Additionally, the album showcases some of most complex and well-told street stories this side of The Great Adventures of Slick Rick. Prodigy and Havoc are two hungry lyricists on the album, although Prodigy is on another level here. You can reference his menacing verse on “Shook Ones”, or his heart-wrenching ode to his comrade on the run from the law on ”Temperature’s Rising”. Prodigy’s verse on “Survival of the Fittest” directly tells a tale of how unforgiving the New York City streets can be. Havoc is no slouch on the mic, either – he opens the album with finesse on “The Start of Your Ending (41st Side), and gives you a harrowing account of a romantic tryst-turned-setup on “Trife Life”. But what really throws The Infamous over the top – what really makes the record a great album as opposed to a very good one – is Havoc’s relentless production. If you are a fan of harder Hip Hop, including pounding, boom-bap drums and chilling jazz samples, you already know that the beats on this album are among the best Hip Hop has to offer, across any facet of the genre, released in any year. The soundscapes are not for the faint of heart – the beats on “Q.U. – Hectic”, “Survival of the Fittest” and especially “Shook Ones Part II”, are perhaps some of the most bone-chilling instrumentals ever. As if Havoc’s work wasn’t enough, A Tribe Called Quest legend Q-Tip steps in for three brilliantly-constructed jazzy beats – “Give Up the Goods (Just Step)”, “Temperature’s Rising”, and the excellent “Drink Away The Pain (Situations)”. The cherry on top to The Infamous may be the guest appearances. You get an Illmatic-era Nas and a Cuban Linx-era Raekwon on the brilliantly horrifying “Eye For An Eye (Your Beef Is Mines)”, the debut of furious hustler-turned-rapper Big Noyd on “Give Up the Goods (Just Step)”, another Raekwon appearance featuring a dizzying back-and-forth with Ghostface Killah on “Right Back at You”, and a post-Midnight Marauders lyrical gem from Q-Tip on “Drink Away the Pain (Situations)”. I dare you to listen to a song like “Q.U. – Hectic” and not be moved by the twisting saxophone sample, the hard, pounding drums, and the haunting, swirling, low melodic sound (who the hell knows what that sound is, anyway), that paints a sonic canvas of yesteryear’s inner city New York. Try not nodding your head to Q-Tip’s crisp, popping drums and brilliantly sampled melody on “Give Up the Goods”. Try your hardest to shake the feeling of creeping death on “Cradle to the Grave”. If you don’t get a head rush or chills down your spine during both Prodigy and Havoc’s verses of street-level despair on “Shook Ones, Pt. II”, over that mind-blowing beat, then you’re probably a robot. If there’s one downfall of The Infamous, it’s that it is not a very accessible record to those who don’t appreciate truly gritty, angry, and even emotional Hip Hop. I have tried to turn friends on to Hip Hop for the first time using this record – and most times, it’s failed miserably. The album is not a happy listen – it’s one of pain, struggle, violence and despair. But isn’t that deeply-rooted despair a major quality that has made so many albums, across all genres of music, stand out and become so well-regarded? Would Nick Drake’s 1972 folk rock classic Pink Moon be so celebrated without that pain-addled demeanor? What about Neil Young’s heartbroken hopelessness on After the Gold Rush? Certainly, Amy Winehouse’s Back to Black wouldn’t have received the same type of acclaim that it has if it weren’t essentially a dark prelude to her untimely death. The despair isn’t as simple as a broken heart on The Infamous – the despair symbolizes a broken life for New York City’s poorest of the poor. The Infamous is so gritty that it is beautiful. It’s music like this – Hip Hop or otherwise, that’s so deep and driven by a certain energy – that is the most meaningful and impactful. It just so happens that this aforementioned energy, mixed with the best of the best musical elements that Hip Hop has ever had to offer over nearly 40 years of existence, came together perfectly on The Infamous. The lyrical hunger of Havoc and Prodigy, fused together with a few notable cameos, added to the powder keg that is Havoc’s dark ear for noir Hip Hop production and brilliant jazz samples, make this one of the most complete Hip Hop albums of all time. 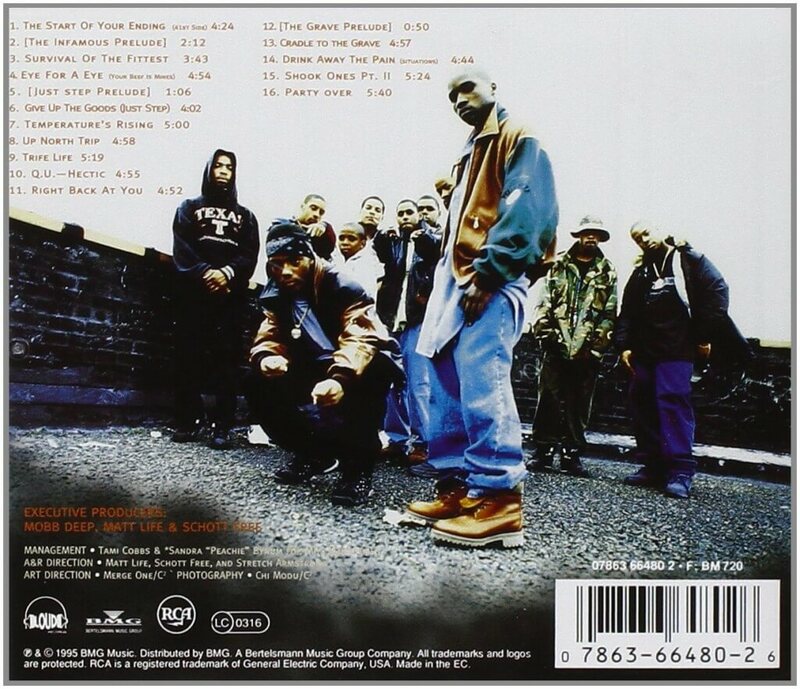 The album even has a bit of mainstream appeal – “Shook Ones”, despite being perhaps the darkest Hip Hop song of all-time, received heavy radio rotation, especially after hours, in New York City and Philadelphia for years after it came out. Aside from sporting probably the best Hip Hop beat of all time, featuring a spine-tingling piano sample and a chilling air horn noise throughout, “Shook Ones” is among the most lyrically graphic songs of all-time, but does not contain even one curse word. Prodigy and Havoc deserve a ton of credit for that alone. If you’re exclusively a fan of Hip Hop with a lighter and more positive sound, The Infamous likely will not resonate with you very well. This is album is not for the faint of heart. It is a dark, depressing, gritty listen that reminds you just how rough the streets can be. However, it sports tactical (and underrated) lyrical performances from Prodigy and Havoc, and some of the most excellent non-DJ Premier produced beats of the entire decade. Don’t let The Infamous get lost among other classics that came out during the same time. This album is on the same level as Ready to Die, Liquid Swords, Enter The Wu-Tang and even Illmatic. The album should garner just as much acclaim and attention as those albums, and I won’t stop lobbying for The Infamous’ status as one of the greatest Hip Hop albums of all-time until it receives that much-deserved recognition.